I could not resist. I had to do it. I had to cook fish curry this weekend. 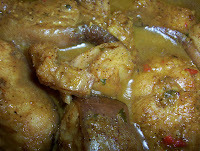 I cooked the last of the gilbaka I got from Guyana. Heat water to boil in a kettle or sauce pan. In a karahi, wok, or stew pan, heat oil until it's hot but not smoking. Pour enough boiling water to cook the fish and leave enough gravy. The gravy should not be watery but thick from reducing as it cooks/boils. Cover the pan and let cook until fish is done and gravy is the consistency you desire.